While I kind of trashed Russell's Reserve Rye not too long ago, it did make me think about how the whiskey could be salvaged. Especially in cocktails, it just felt too thin. I mentioned at the time that bitters could help, but they didn't provide compete satisfaction. So what could beef it up? Now this is what I was looking for. With a 3:1 ratio of rye to rum, everything I like about rye is still present, but instead of being unidimensional, the rum buttresses those flavors with caramel, molasses and chocolate. Dark fruit flavors creep out of the glass and the swallow delivers on the promises of the nose. It's fairly safe to say that this is more than the sum of its parts. In this case I decided to take the opposite tack. 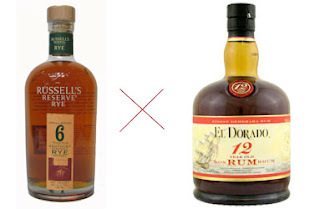 A rum with almost insufferably potent flavors mixed with an extremely smooth wheated bourbon. 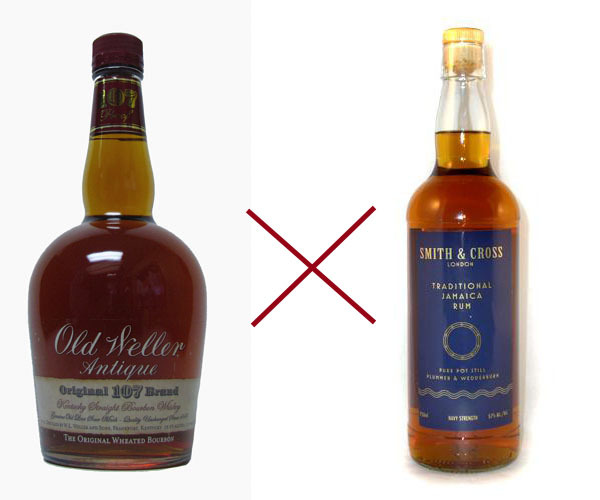 With that said, they both pack a punch in their own rights as the Weller is 107 proof and the Smith & Cross is navy proof at 114. Using the same 3:1 ratio of whiskey to bourbon, it was initially still too much. Between the high proof and intense esters of the rum, there was a solid burn going down. However, after a few drops of water and a couple more minutes in the glass, the blend settled down into something much more enjoyable. While still dominated by the rum, sweet brown sugar began to emerge and a hint of grain from the whiskey. The high ester rum still hits you full in the face with funk, but it's a much more pleasant experience. This is something I will definitely be drinking again. This blend centered around tempering and enhancing the characteristics of the La Favorite Rhum. While retaining some of the characteristics of rhum agricole, it smells and tastes like it was dosed with charred barrel extract. A little goes a long way. The Rhum J.M. has spent much less time in the barrel and retains more of the almost brandy-like agricole flavors that have been obliterated in the La Favorite offering. The Ezra B has a savory spiciness that compliments the two agricoles. In a 1:1:1 ratio, this blend turns out to be fairly pleasant. There are a lot of strong flavors here, but they manage to mesh reasonably well. The burnt wood, brandy and grain all dance around each other, no one ever quite dominating. It gets sweeter and almost creamy with a bit of water. Unsurprisingly, there's a bit of heat as two of the three spirits are right around 100 proof. All in all, I'm not sure that this was the best blend, but it was an interesting and worthwhile experience. In some respects I feel like this is an extension of the tiki drink methodology. You take flavors from one spirit that aren't found in another and put them together to make flavors that can't be found in a single spirit. There's a lot more experimentation to do and I look forward to trying this again. So, yeah. Rye. Seems to be most of what I've been drinking lately, in no small part because it's a lot easier to pour a dram at the end of the day than to put a proper cocktail together. As I've been promised a bottle of something that I wouldn't normally try myself, I decided to try the best ryes that I could find. And as far as I can tell, it's pretty hard to beat what the Buffalo Trace Distillery puts out as part of their annual Antique Collection. A new set of bottlings is put out each year in the fall and includes three bourbons and two ryes. They all cost a pretty penny, but represent some of the oldest and best liquor to come out of the distillery. This is a very hefty barrel-proof bottling at roughly 129-proof that was aged for about six years. These are fairly distinct features from most of the other collection, which tend to be much older and lower proof (the George T. Stagg being an exception). With that said, this is a magnificent whiskey. Neat, the nose has a fairly standard set of rye grain, vanilla and spice flavors. The spice is somewhat augmented by the strength of this whiskey, as they both run fairly hot. The taste delivers on the promise of the smell with an almost brutally long finish that lasts even after a sip of water to cool down. I won't say my mouth was actually getting burned, but it wasn't too far off. But all in a rather enjoyable fashion. After a few drops of water, the whiskey opened up a bit to reveal some chocolate. The grain flavors receded slightly, more of a reminder of where the whiskey came from rather than being up in your face like more pedestrian bottlings. Time and a little more water brought our molasses and greater sweetness. After I was done, the glass retained an amazingly amount of odor, which was redolent of grain, milk chocolate and fruit. I really would have liked to be able to measure this properly to bring it down to a more recognizable 100- or 90-proof, but my wallet only allow for a small-ish pour and I didn't want to drown it. I'm pretty tempted to buy a bottle, so I may be able to report back with more info at a later date. This whiskey has won any number of accolades, twice winning "World Whiskey of the Year" from Jim Murry's Whiskey Bible. Though some other reviews had made me a little bit wary that it would live up to the hype, it more than delivered in my opinion. Neat, the nose was explosive with honeyed sweetness, mint, orange and a hint of spice underneath. To give you a sense of just how rich this smell was, after lifting my notebook off of the top of the glass, I could instantly smell it without even leaning forward. The taste mostly recapitulated the smell, with surprisingly little bite or heat for a rye whiskey. The finish was rather short, but very smooth. Adding a bit of water transformed the nose into berry jam with rye grain underneath. The taste contained very subdued grains behind huge honey sweetness. The taste did seem just a bit thinner and the peppery spice actually kicked up a notch. The finish was ultimately still fairly short. The residual whiskey left in the glass after I was done still contained smells of orange, grain, chocolate and fruit that lingered for more than an hour. This was still such a potent smell that the uncovered glass sitting on the table could be detected from several feet away. 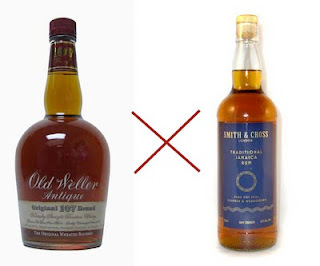 In summary, if you get a chance to drink either of these whiskies, go for it. They're not cheap pours, but the the experience is more than worth the price of entry. After finishing the Sazerac, I posted "This is going to ruin me for all other whiskey for all time". While a bit of hyperbole, it really was that good. 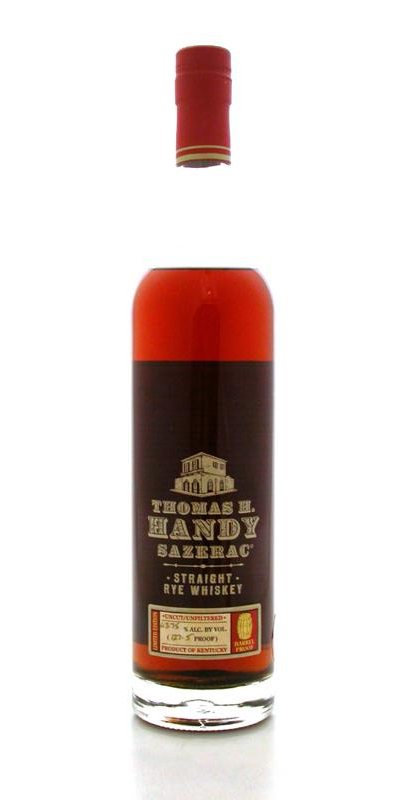 I'm currently trying to hunt down a bottle of the Sazerac 18-Year and considering a bottle of the Thomas Handy, which is a little bit easier to find. Either way, you can bet that I'm going to be nearly the first in line when this year's bottlings come out.